I seem to have all things baby on my mind lately, which I haven't had to think about in years. And I have to say it's been a lot of fun! 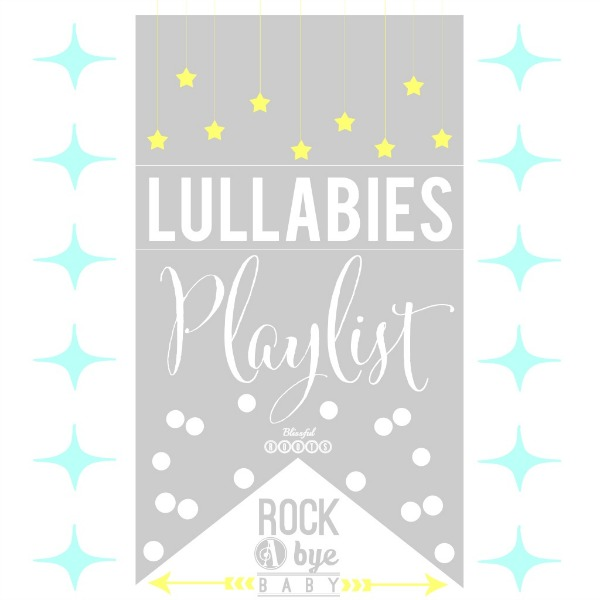 I also haven't posted a playlist for awhile, so in honor of all things baby, I have a lullabies playlist to share with you today. And actually, all three of my boys (ages seven and four) still listen to the Tender Lullabies CD (you'll see the songs in my playlist) to fall asleep at night. It's so relaxing and peaceful! So, along with those favorites, I'm excited to add a few new songs to add to the baby atmosphere that will be here in a couple of months for our family. You can listen to my entire lullabies playlist on Spotify. You just need to download it to listen, and it's free! So, hop on over and download today. Not only can you listen to my playlist, but you can listen to anything! I LOVE Spotify! Cool! I wish I had this when my daughter was younger! I used to play the same lullaby album over and over on my iPhone. It was the only way I could get her to sleep. I've never used Spotify before, so am going to go check out and download it, as she still likes her lullabies when she is sick or sad, even though she is five now. Thanks for sharing! I think the lullabies were just as much for me as they were for my baby twins when they were first born! I needed a bit of calming and soothing myself. And yes, go try out Spotify! You'll love it! Thanks so much for visiting, Maureen! Awesome ! I wish If it could be for my younger sister. She will love it. Thank you so much for sharing this excellent post. Excellent post sharing. Love your post. Keep writing.